The Swagtron T6 Off-Road Hoverboard was announced at CES 2017 in January and was released later the same year. This is Swagtron’s newest electric scooter in the off road electric rideables market, and is their best hoverboard in the popular T-series. That’s because this is an all terrain hoverboard unlike the Swagtron T580, T1, T3 and T5 which are already on the market. These hoverboards are most suitable for use on smooth ground (urban terrain) or indoor use. Also known as the Swagboard Outlaw, this however is suited to a variety of terrains like sand, gravel, snow, mud, grass and all sorts of bumps and inclines making it a better board for those looking for a bit more adventure! Armed with air-filled 10-inch rubber tires, tough off-road body designs and non-slip footpads, this all-terrain warrior appears all set to take you on the wildest expeditions you’ve ever dreamt about. But does it have the power to keep you going for long enough? This Swagtron T6 review will tell you everything you need to know about this new off-road hoverboard. This electric scooter boasts 10 inch inflatable rugged tires mounted on aluminum rims. These inflatable tires belong to a class of their own – you won’t find them on any other Swagtron models from T1, T3 to T5. The main benefit of having inflatable tires as opposed to the solid ones is that they are able to absorb shock loads from rough terrain. Air filled tires are known for their ability to deal with bumpy surfaces or in situations where one may encounter sudden shock loads. A giant like this one requires quite some power to keep it moving. That’s why this hoverboard is powered by 350-watt motors. Speed may not differ too much, but generally, motors with more than 300 watts are recommended for off-road use and adult use. As such, the T6 does not disappoint when it comes to propelling you through all those potholes and bumps. The only precaution you may need to take is scooting through a deep puddle – doing this will submerge your scooter allowing water to leak into the wheels which may cause your battery to wear out. To ensure the battery lasts long enough despite the harsh conditions of off-road rides, the T6’s battery boasts SentryShield multi-layered battery protection, which essentially encases the battery in a damage-proof (fire-proof) aluminum casing. This technology is patented to Swagway Systems (the registered company behind the Swagtron brand), and is perhaps one of reasons Swagtron Hoverboards pass the UL Certification testing. In terms of speed, most models offer speeds from as low as 2mph to as high as 10mph. Considering that bracket, the T6 offers above average maximum speed (at up to 12mph) . And as far as range is concerned, this self-balancing scooters delivers an incredible 11 miles which is by all means a great feat. It is always important to choose the correct self-balancing scotoer for your weight, otherwise, you might be unable to use it properly. Fortunately, it boasts of being the first in the world to handle over 380lbs, which is almost double what most other self-balancing scooters are capable of. It’s one of the few self-balancing scooters on the market suitable for riders of all shapes and sizes. A vital component of hoverboarding is making sure you are safe on the road and that you can comfortable navigate your way even when visibility is low (e.g. early mornings and late evenings). With built-in energy dual lights that utilize LED diode technology to emit 6.5 feet of light in both directions, the Swagtron T6 offers one of the safest rides in town. So you don’t need to incur extra expenses to buy special hoverboard shoes. These flashing LED lights were designed to make your ride as smooth as possible. We all need to pick up and carry our hoverboards from time to time. But as you might have realized with your other self-balancing scooters, a carrying handle is one important feature that’s conspicuously missing from most models. 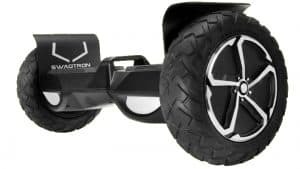 The Swagtron T6 off-road hoverboard features a short built-in carrying handle in the middle that makes it easy to grip and carry around when you don’t feel like riding, or when you run out of battery. It is worth noting that this feature is only available on T6 and T3 models only. This is one of the most intriguing features of the new hoverboard because it allows you to play music directly from your smartphone. The mode is activated once the self-balancing scooter is turned on, giving you a “discoverable” signal allowing you to create a connection. Afterwards, you will only need to open your music player app and starting blasting your favorite tunes as you scoot your way ahead. What’s more, you can control the volume using your phone as well. What if you could implement long-distance controls to your scooter via phone? Nothing is impossible with the new Swagtron App. You simply need to get the app from Google Play or App Store and download it. Once that is done, you can connect with your hoverboard by pressing the connect button. You will access an interface that will help you see monitor parameters like speed, battery power level and cumulative mileage. You can also activate the hoverboard or even adjust the hoverboards speed and sensitivity using app settings. 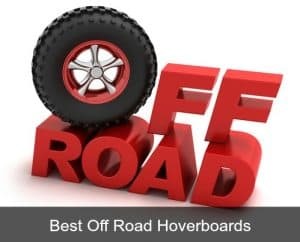 Looking at the other off road hoverboards on the market e.g the Halo Rover, Jetson Rover V8, Epikgo etc. which all cost in the region of $500, this self balancing scooter is one of the best value all terrain transporters on the market at the moment. Right now its available for just $379.00 on Amazon. What makes it a good pick? 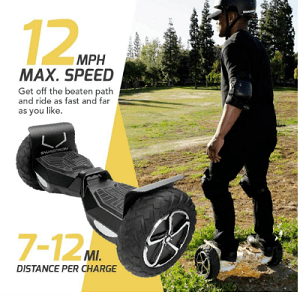 More expensive than other Swagtron hoverboards due to its off road capability and added extras such as bluetooth to play music, mobile app etc. In the case of this scooter you get what you pay for – it might cost a bit more but you get a whole lot more too! Inside the box is your hoverboard, one T6 charging adapter (AC) and one T6 user’s manual and paperwork. Each package comes with a 30 day limited return policy for new/unused condition items. Can I trust that it won’t go on fire? Like its other siblings, the battery included in the T6 is UL 2271 certified – the lithium battery is also protected under a special Sentry Shield layer so there’s no danger of fire or overheating. 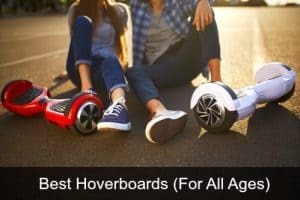 The hoverboard is also fully UL2272 certified (this is the new certification for next generation personal e-mobility devices such as self balancing scooters, electric scooters etc.) To achieve this certification a product needs to pass numerous fire safety and electrical safety tests. The product is covered by a one-year manufacturer warranty that covers mechanical defects. This warranty covers accidental damage only. 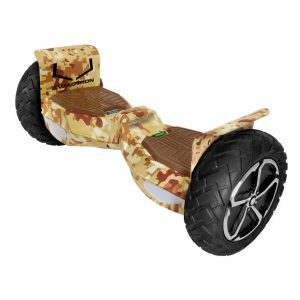 This is Swagtron’s first off-road hoverboard, so it is the only one of their T series hoverboards that can travel over a variety of terrains. The rest are most suitable for use on pavement and smooth ground. 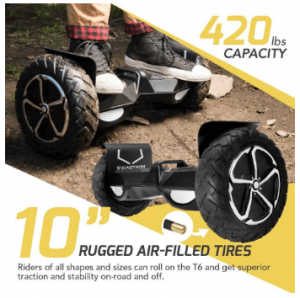 All terrain hoverboards are bigger (this has 10 inch wheels vs traditional 6.5 inch wheels), and are more powerful in general. Consequently, it is the most expensive of the lot, although is very good value for the price (less than $500). Like the T3 it also has Bluetooth capability with built in speakers, 3 different riding modes, and a mobile app that can be used to monitor battery life, check route history etc. and a built in carrying handle. However it far surpasses the T3 in terms of where you can actually ride it. It’s also bigger and more powerful. 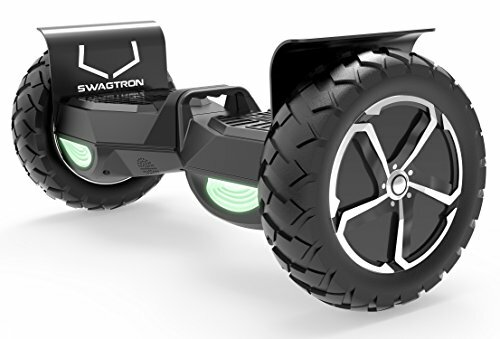 Like the other Swagtron models it has LED lights, rubber bumpers, and non slip footpads. Top speed and range is similar for all current models – they reach a top speed of 8mph (except for the T5 which is slower and is more of an “entry level” hoverboard). The top speed for this scooter however is 12mph, which is one of the fastest hoverboards currently available on the market. 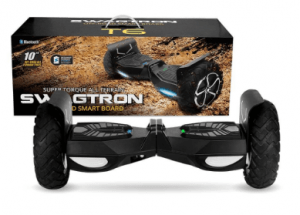 Swagtron T6 vs Off-Road Hoverboard Competitors? The T6’s main competitors will be the Halo Rover (currently our top rated hoverboard), the Jetson V8 and the Epikgo hoverboards. All these are great all terrain hoverboards, but the T6 is slightly different and does have its own USP. First of all, the others have 8.5 inch wheels but the this off roader has 10 inch wheels so is slightly bigger. The T6 has a whopping 400lb weight limit (vs under 300lbs for most other hoverboards) so will have the highest weight capacity of any hoverboard on the market. The other off road hoverboards have a max capacity of just 260-300lbs. Speed and range is similar for the other 3 with a max speed of 10mph – the Swagtron T6 however can travel at up to 12mph for a range of 10 miles. 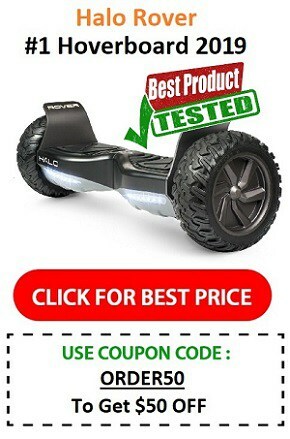 Price wise its actually a little cheaper than other all terrain hoverboards on the market with similar specs. 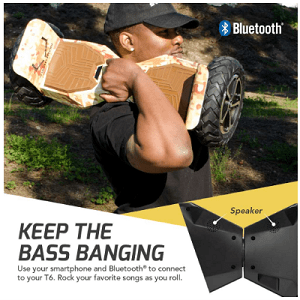 Most other features are similar – Bluetooth speaker, mobile app, air filled tires, tough off road exterior etc. After testing out the Swagtron T6 off-road hoverboard, I think this is one of the most exciting self-balancing scooters to hit the market and it proven to have great potential with its off road capacity, bluetoooth speaker and mobile app. 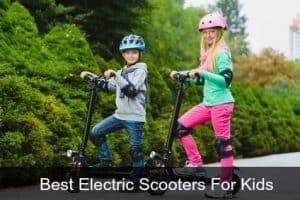 Swagtron are a decent US based brand with good products and customer service. The T6 was one of the top selling all terrain hoverboards from 2017 until now, so its well worth checking it out. Plus, at less than $500, this is actually one of the cheapest off-road hoverboards on the market right now! With the maximum load capacity of 380lbs this electric scooter will make hoverboard riding more accessible to a wider audience as all other boards (right now) only carry between 220lbs and 300lbs. This isn’t just for the heavier rider though – its even suitable for kids! Whether you want to ride around your kitchen, or go off roading and roll over bumps, ride in rain and even gravel, this is a great choice for riders of all ages, shapes and sizes. It’s certainly one of the best hoverboards right now in the off road range. Right now the T6 is available for sale on Amazon. Just click on the link to check it out. Get One Now While It’s Under $500! I hope you’ve found our Swagtron T6 review useful. If you have any questions or need more info just get in touch (use the comment section below). 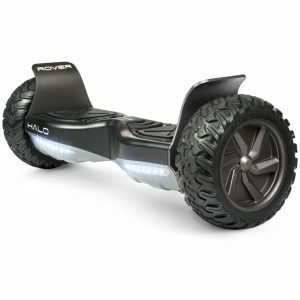 This is the newest all terrain hoverboard on the market, and is also one of the cheapest! Its main USP though is that it has a huge weight capacity of over 380lbs (its strongest competitor can only carry 300lbs).